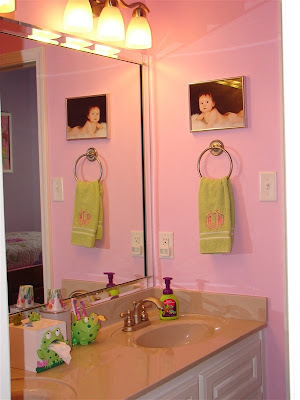 The jack-n-jill bathroom. 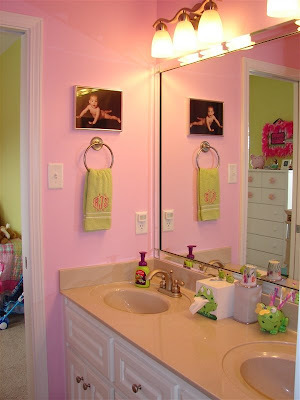 I decided to paint it pink since that was a color that was in both Rachel and Rebekah's bedrooms. I love how it turned out. I found the frog decorations for the bathroom at Target - love that place! My mom was so kind and bought it all for the girls as a house warming gift for them. 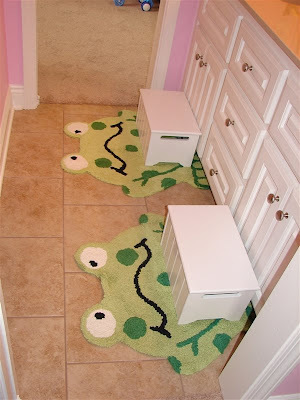 They love their froggy bathroom! The counter height in this bathroom isn't as high as it is in the master bathroom or Nana's bathroom. But it is high enough that Rebekah needed a stool to wash her hands. Rachel wanted one too, so thankfully I was able to find two while small stools. I couldn't have very big ones or they would take up too much room. Looking into the bathroom from Rachel's bedroom. Looking at Rebekah's side of the vanity. I have pictures of both girls when they were six months old. They both have the classic naked bottom shots. Rebekah's is the one you see here hanging above her hand towel. 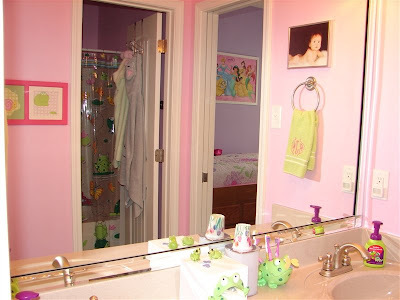 Looking into their potty and bathtub/shower room. It's a tight squeeze in there. To help conserve space, we had pocket doors installed. The pocket doors are the ones that go to each bedroom. Now there isn't a problem with a door in the way in their bedrooms. So glad we made that choice! Here's a shot looking back and you can see the door there going into where the bathtub is. I have their bath towels hanging there on the door. And now a shot from Rebekah's bathroom doorway. You can see Rachel's bare bottom photo. I had the girl's initials embroidered on their hand towels. I was having a hard time finding hand towels with pink and green in them. So, I just got green hand towels and had the embroidery done in pink! 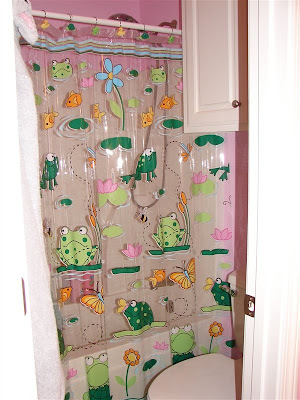 LOVE the frog theme! Very cute!